More than 60 died and many were wounded in three car bomb attacks in Iraq. Two struck in Baghdad's Sadr City, the worst incident claiming 34 lives. The first blast hit a market in a Shiite district of east <?xml:namespace prefix = st1 ns = "urn:schemas-microsoft-com:office:smarttags" />Baghdad on Sunday morning. The area was crowded with shoppers and vendors. At least 34 died and more than 70 were injured. Just hours later, a second bomb rocked a municipal government building in the same area. 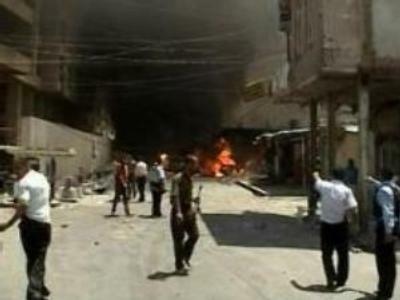 At midday, a car bomb blew up near a courthouse in the northern city of Kirkuk, leaving scores dead and injured. This was the fourth such incident this month in Kirkuk, scene of rising tension among Arabs, Kurds and Turkomen. Feuding groups seek control of a city considered the centre of Iraq's northern oil industry. Sunday blasts followed a night of heavy clashes in Sadr. Iraqi troops raided a site there, targeting suspected members of a sectarian death squad. U.S. officials said eight were detained. Raids and bombings hightened tension in Baghdad as extremists and security forces battled for control of the Iraqi capital. Revenge killings between Shiites and Sunnis have plunged the city into a security crisis. The violence comes amid further accusations of abuse committed by U.S. troops in the country. A report by Human Rights Watch said detainees in Iraq had been physically mistreated. Soldiers' accounts show prisoners faced beatings and sleep deprivation as part of the interrogation process. Iraq’s prime minister is on a trip to London and Washington for talks on security and how to combat continuing sectarian violence.